EABASSOC Spraytec is a water based, spray applied system, which cures instantly to form a seamless, highly elastic waterproofing membrane. It consists of a special rubber bitumen emulsion and a liquid precipitant, which when simultaneously sprayed, produce an instantaneous solid membrane on the substrate. 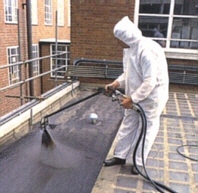 EABASSOC Spraytec cures instantly to form a versatile elastomeric waterproof membrane. It has a variety of applications including roofing, tunnels, underground structures, water channels and reservoirs. It is principally used in areas where fast curing is essential and is considered one of the most cost effective products of its type. Application by spray is fast and easy. A single coat is normally sufficient and up to 1000 square metres can be applied in a single day. It is unaffected by water so can be applied on uncured concrete and damp surfaces without re-emulsifying. It can be sprayed directly onto most surfaces and has excellent adhesion. The high pH value also gives it good corrosion properties. The membrane formed is seamless and soft, so, although it resists puncturing it can be cut by a knife. However, unlike other membranes it is self healing and so, due to its elastic recovery and high level of adhesion, it will join back together. 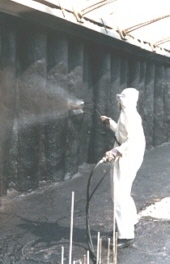 EABASSOC Spraytec is water based, non-flammable, does not give off toxic fumes, and is environmentally friendly. EABASSOC Hitec Waterproofing Membrane is the brush applied version of Spraytec. Hitec can be applied where detailing work is necessary, which cannot be carried out using Spraytec. Hitec is a one-component, cold applied rubber bitumen emulsion, forming a seamless, highly elastic, waterproofing membrane. It is very easy to apply, non-hazardous and is free of solvents and plasticisers, making it suitable for both internal and external sealing work.